The Cyrus Cylinder (c.539-530 B.C.E.) is an ancient artifact consisting of a declaration of religious reform issued by the emperor Cyrus II (the Great), the founder and ruler of the Persian Empire, and inscribed in Babylonian (Akkadian) cuneiform on a clay cylinder. It was discovered in 1879 by the Assyro-British archaeologist Hormuzd Rassam in the foundations of the Esagila (i.e., the Marduk temple of Babylon) and is kept today in the British Museum in London. The Cyrus Cylinder is among the most significant ancient texts to provide independent support of the historicity of one of the central events of biblical history: the return of the Jews to Jerusalem under the sponsorship of Cyrus the Great to rebuild the Temple. While Cyrus credited the inspiration of the Babylonian deity Marduk for his policy of religious reforms and restoration of the temples of lesser local deities to their "eternal abodes," the Bible sees Cyrus as the agent of the Hebrew God Yahweh. The Book of Chronicles even quotes a supposed edict of Cyrus in which the king names Yahweh rather than Marduk as inspiring his actions. The Book of Isaiah, however, specifically mentions that Cyrus did not acknowledge Yahweh, yet refers to Cyrus as a "Messiah"—God's anointed—called by name by God to achieve a great destiny. 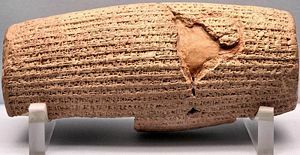 Because of its commitment to religious tolerance and its policy of ending some forms of forced labor, the Cyrus Cylinder has sometimes been described as the "first charter of human rights," although it reflects a long tradition in Mesopotamia where kings began their reigns with declarations of reforms. After several earlier successful military campaigns in the region, Cyrus conquered the great city of Babylon without resistance in October, 539 B.C.E., assuming the titles of "king of Babylon, king of Sumer and Akkad, king of the four corners of the world." His predecessor, Nabonidus had been a devotee of the Moon god Sin and was not part of the previous Chaldean dynasty, of whom Nebuchadnezzar II was the most famous member. Cyrus accuses Nabonidus of neglecting the chief Babylonian god Marduk and persecuting other sects. Although Nabonidus' personal preference for Sîn is clear, scholars do not agree as to the extent of his restrictions on religious worship. Some claim that it is obvious from his own inscriptions that he became almost henotheistic, banning the worship of other gods. Another explanation is that he alienated the dominant priests of Marduk by not giving this deity the honor they believed he deserved. The Cyrus Cylinder was placed under the walls of the Temple of Marduk at Babylon as a foundation deposit, following a long Babylonian tradition. Passages in the text have been interpreted as expressing Cyrus’ respect for humanity, and as promoting a form of religious freedom. Cyrus' policies of restoring local religious temples and ending forced labor apparently did win him support from his subjects. Since the 1970s, the Cyrus Cylinder has been described as the world’s first charter of human rights, It was translated into all six official U.N. languages in 1971. A replica of the cylinder is kept at the United Nations Headquarters in New York City in the second floor hallway, between the Security Council and the Economic and Social Council chambers. However, while the cylinder clearly reports Cyrus' policy of restoring local religious shrines and ending certain forms of forced labor, some scholars have argued that it is overstating the fact to call the document a human rights charter. 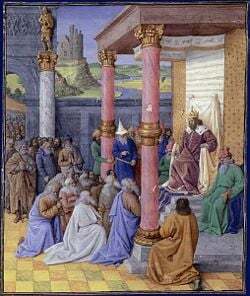 Cyrus meets with Jewish leaders before sending them to Jerusalem to rebuild the Temple of Jerusalem. Nevertheless, the cylinder tends to confirm the historicity of the biblical report that Cyrus allowed Jewish leaders in Babylon to return to Jerusalem and rebuild the Temple of Yahweh there. The Bible records that the immediate ancestors of these Jews had been conquered and exiled to Babylon by Nebuchadrezzar. The biblical version of the story mentions an edict from Cyrus (Isaiah 44.23-45.8; Ezra 1.1-6, 6.1-5; 2 Chronicles 36.22-23) allowing the Jews to return and supporting the rebuilding project. Although the cylinder's policy does not extend as far west as Israel, it does indicate that Cyrus initiated a program of restoring local religious temples and their sacred artifacts. The Cyrus Cylinder states: "to Aššur and (from) Susa, Agade, Ešnunna, Zamban, Me-Turnu, Der, as far as the region of Gutium, the sacred centers on the other side of the Tigris, whose sanctuaries had been abandoned for a long time, I returned the images of the gods who had resided there to their places, and I let them dwell in eternal abodes. I gathered all their inhabitants and returned to them their dwellings." In the first year of Cyrus king of Persia, in order to fulfill the word of the Lord spoken by Jeremiah, the Lord moved the heart of Cyrus king of Persia to make a proclamation throughout his realm and to put it in writing: "This is what Cyrus king of Persia says: "'The Lord, the God of heaven, has given me all the kingdoms of the earth and he has appointed me to build a temple for him at Jerusalem in Judah. Anyone of his people among you—-may the Lord his God be with him, and let him go up.'" The Cyrus Cylinder in the British Museum in London. The text consists of two fragments. The larger, known as "A" (measuring 23 x 8 cm) contains lines 1-35 and Fragment "B" (8.6 x 5.6 cm) contains lines 36-45. "A" has been in the British Museum since shortly after its discovery. "B" had been kept at Yale University, but has been transferred to the British Museum. In summary, the text begins by listing the crimes of Nabonidus, Cyrus' predecessor as king of Babylon, which included desecration of the temples of the gods and the imposition of forced labor ("corvee-work") upon the populace. The chief god of Babylon, Marduk, is highly displeased by Nabonidus' cruelties and calls upon Cyrus of Persia to conquer Babylon and restore a proper policy of worship. 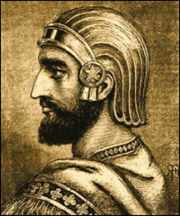 Cyrus accomplishes this by his personal devotion to Marduk and by restoring the other gods to their temples and putting an end to forced labor, at least of the nobility. The conquest of Babylonia paved the way for what was then the largest empire the world had ever seen. A weakling has been installed as the king of his country... sacred cities inappropriate rituals… daily he did blabber [incorrect prayers]. He interrupted in a fiendish way the regular offerings… within the sacred cities. The worship of Marduk, the king of the gods, he [change]d into abomination. Daily he used to do evil against his (i.e. Marduk’s) city… He [tormented] its [inhabitant]s with corvee-work without relief. He ruined them all. Upon their complaints the Lord of the gods became terribly angry and [he departed from] their region, (also) the (other) gods living among them left their mansions, wroth that he had brought (them) into Babylon. Marduk… on account of (the fact that) the sanctuaries of all their settlements were in ruins and the inhabitants of Sumer and Akkad had become like (living) dead, turned back... and he had mercy. He scanned and looked (through) all the countries, searching for a righteous ruler willing to lead him (in the annual procession). (Then) he pronounced the name of Cyrus, king of Anshan, declared him to be the ruler of all the world. He made the Guti country and all the Manda-hordes bow in submission to his (i.e. Cyrus’) feet... Marduk, the great lord, a protector of his people/worshipers, beheld with pleasure his (i.e. Cyrus’) good deeds and his upright mind (and therefore) ordered him to march against his city Babylon... He delivered into his (i.e. Cyrus’) hands Nabonidus, the king who did not worship him (i.e. Marduk). All the inhabitants of Sumer and Akkad, princes and governors (included), bowed to him (Cyrus) and kissed his feet, jubilant that he (had received) the kingship, and with shining faces. Happily they greeted him as a master through whose help they had come to life from death (and) had all been spared damage and disaster, and they worshiped his name. I am Cyrus, king of the world, great king, legitimate king, king of Babylon, king of Sumer and Akkad, king of the four rims (of the earth), son of the great king Cambyses, king of Anshan, grandson of the great king Cyrus, king of Anshan, descendant of the great king Teispes, king of Anshan, of a family (which) always (exercised) kingship, whose rule Bel and Nebo love, whom they want as king to please their hearts. When I entered Babylon as a friend and I established the seat of government in the palace of the ruler under jubilation and rejoicing, Marduk, the great Lord [induced] the magnanimous inhabitants of Babylon [to love me], and I was daily endeavoring to worship him. My numerous troops walked around in Babylon in peace, I did not allow anybody to terrorize (any place) of the [country of Sumer] and Akkad. I strove for peace in Babylon and in all his (other) sacred cities... I abolished the corvee (lit. : yoke) which was against their (social) standing. I brought relief to their dilapidated housing, putting an end to their complaints. Marduk, the great lord, was well pleased with my deeds and sent friendly blessings to myself, Cyrus, the king who worships him, to Cambyses, my son, the offspring of [my] loins, as well as to all my troops, and we all [praised] his great [godhead] joyously, standing before him in peace. All the kings of the entire world from the Upper to the Lower Sea, those who are seated in throne rooms... all the kings of the west land living in tents, brought their heavy tributes and kissed my feet in Babylon. ...From as far as Ashur and Susa, Agade, Eshnunna, the towns of Zamban, Me-Turnu, Der as well as the region of the Gutians, I returned to (their) sacred cities on the other side of the Tigris, the sanctuaries of which have been ruins for a long time, the images which (used) to live therein and established for them permanent sanctuaries. I (also) gathered all their former inhabitants and returned (to them) their habitations. Furthermore, I resettled upon the command of Marduk, the great Lord, all the gods of Sumer and Akkad whom Nabonidus has brought into Babylon to the anger of the Lord of the gods, unharmed, in their (former) chapels, the places which made them happy. May all the gods whom I have resettled in their sacred cities ask Bel and Nebo for a long life for me and may they recommend me (to him). To Marduk, my lord, they may say this: “Cyrus, the king who worships you, and Cambyses, his son…” … (six lines destroyed). ↑ Muhammad Dandamaev, "The Cyrus Cylinder," in E. Yarshater (ed. ), Encyclopedia Iranica vol. VI, 1993, p. 521. www.iranica.com. Retrieved June 11, 2008. ↑ Schaff, Philip, The New Schaff-Herzog Encyclopedia of Religious Knowledge, Vol. III, Cyrus the Great www.ccel.org. Retrieved June 11, 2008. ↑ Interview with United Nations Under-Secretary Shashi Tharoor www.spentaproductions.com. Retrieved June 11, 2008. ↑ United Nations Press Release, October 14, 1971, SG/SM/1553/HQ263 www.livius.org. Retrieved June 11, 2008. ↑ R.J. van der Spek, "Did Cyrus the Great introduce a new policy towards subdued nations? Cyrus in Assyrian perspective" in Persica 10, pp. 273-285. ↑ Cyrus Cylinder translation, adapted from Schaudig 2001. www.livius.org. Retrieved June 11, 2008. ↑ Cyrus Cylinder: a Declaration of Good Kingship The British Museum, www.thebritishmuseum.ac.uk. Retrieved June 11, 2008. Kuhrt, A. "The Cyrus Cylinder and Achaemenid imperial policy" in Journal of Studies of the Old Testament. This page was last modified on 2 July 2008, at 15:25.